If there's one type of salad that Nigerians can tolerate on the side of their plate, it's the humble coleslaw. 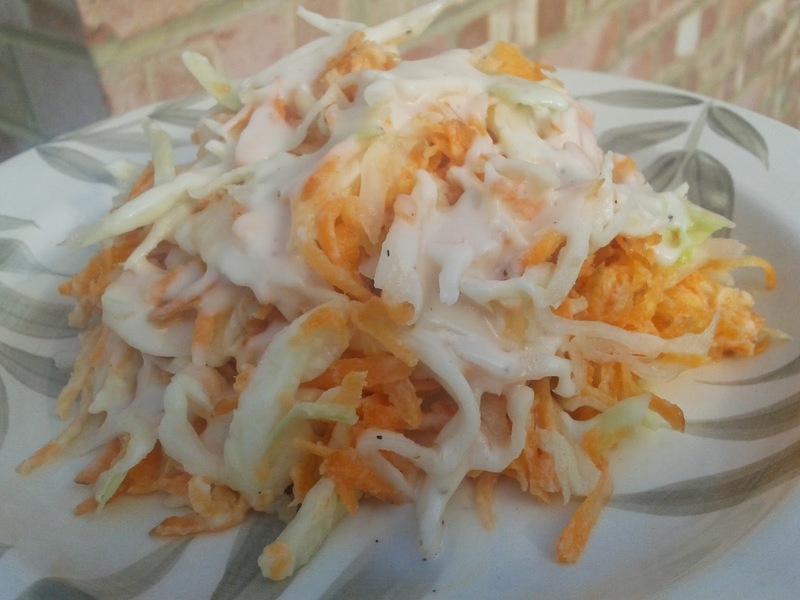 The shredded cabbage and grated carrot is usually held together with a dollop of salad cream and chilled in the refrigerator until the main meal is ready. With the amount of spice and pepper we use in our food, coleslaw offers something of a cooling respite between those fiery mouthfuls. Here is my version of coleslaw with an unbelievably rich vegan salad "cream" dressing. This is my second attempt at the recipe. I used rice flour the first time around but found it to be too grainy. Corn flour provided the right consistency and was a subtle enough base to build in layers of flavour. To make the salad dressing, combine the corn flour and coconut milk to form a smooth paste. Add the vinegar, lemon juice and sunflower oil and whisk vigorously with a fork. The dressing should be able to lightly coat the back of a spoon. Season with salt and black pepper. Place the shredded cabbage and grated carrot in a large salad bowl and pour in a generous amount of the dressing. Give it a good mix and refrigerate until needed. Very nice blog. What market do you get your produce from?? Interesting addition of corn flour, coconut milk, and sunflower oil to the dressing...I never thought about those ingredients in regards to salad dressing before.